Now you have another better and easy way to share you digital photo with your friends, colleague, etc. 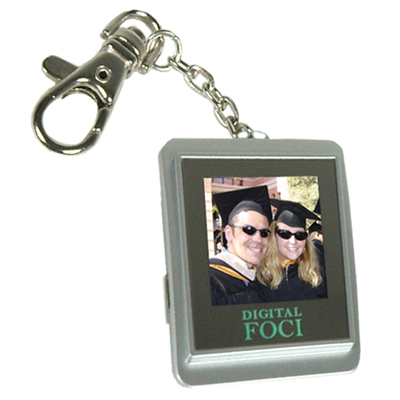 Digitalfoci has invented an innovative and creative pocket-sized digital photo album that you can bring around and proudly show off your photos whenever there is an opportunity. This keychain looked digital photo album comes with a 1.5” colour LCD screen to allow you to view your photos stored inside. You can adjust the LCD contract, brightness level, etc to suit your preference. This album has 8MB internal memory and able to store up to 74 pictures. You can scroll your photos album and show it to your friend either manually or via the photo slideshow function available. This digital photo album supports JPEG and BMP photo formats. To upload your photo to this tiny gadget, you need to use the Photo Viewer Software which attached in the package. The Photo Viewer software will convert the JPEG or BMP files to this Pocket Album’s image format before uploading to the album. This photo-album keychain runs on a Lithium-ion battery and it is last for 9 hours. The battery is chargeable. Besides, it is also featured a built-in clock an automatic on and off time. With the digital photo album function, this superb Chain Link only cost you US$39.95.